The MAD FIGS first became aware of the plot being created by the winged terrors known as Canadian Geese during the 95-96 school year. Scott Dogg, doing research for Forensics, came across a detailed article in Smithsonian magazine which told about how Canadian Geese were causing problems across the US. Since the debate topic that year was immigration, Scott Dogg wrote a case which would stop Canadian Geese from setling permanently in America. The idea met with moderate success, run at the Bakersfield invitational by Scott Dogg and Dervo and by Paul and Robbie, and also for one round at State Quals by Che and Dave. Whether or not it actually won any of these rounds is lost to history, but at least on team had reportedly prepared a "Ducks and Swans" counterplan to be used against the case. After the debate season ended, everyone began paying less attention to Canadian Geese. But the next year, many independent events occured which drew the MAD FIGS' attention back to the problem. It began when House Speaker Newt Gingrich's airplane nearly crashed - because a Canadian Goose was sucked into the engine! Later that year, a commercial airliner crashed, killing over 100 people - because of another Canadian Goose! The MAD FIGS also began seeing threats closer to home - Canadian Geese clocks at Paul's house, Jacob's T-Shirt with a Canadian Goose, and Scott Dogg's blanket with a giant Canadian Goose. Something was going on. The situation came to a head with the release of the pro-goose movie "Fly Away Home." This was the last straw for the MAD FIGS. The Angry Bear organized a protest at the FIG Garden Movie Theatre against the film, complete with picket signs. This protest was featured on the local news, and included Paul's statement about why Canadian Geese are bad and Will and Kim Church reenacting a Canadian Goose attack (Will played the goose). Canadian Geese still remain a problem for the MAD FIGS. In order to combat them, Scott Dogg was appointed Goose Catcher of Forensics, The Bil Nye the Science Guy Club, and Bullard UFO. 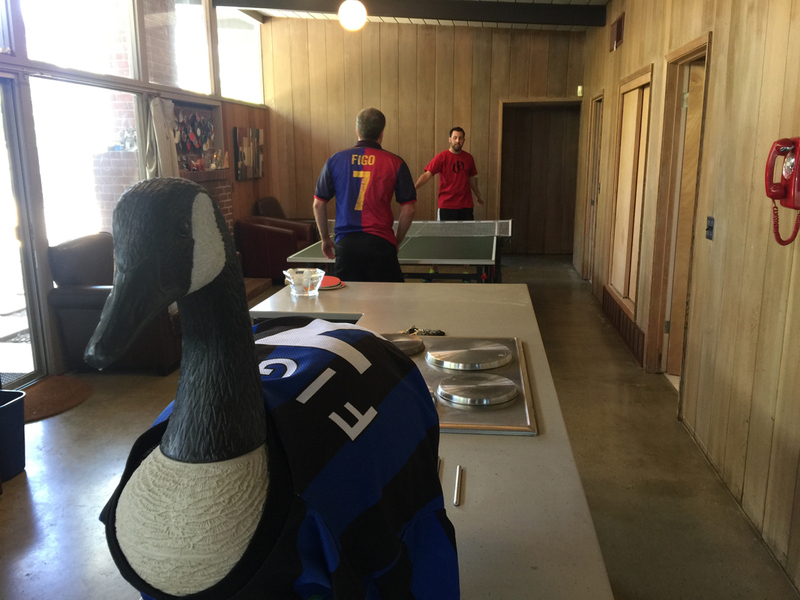 The Canadian Goose Decoy has become a Septathalon fixture, successfully distracting any real geese from attacking the competitors. The 14th place finisher in the previous year's Septathalon is charged with carrying the goose around during the event, and keeping it safe for the rest of the year. The MAD FIGS are always on the lookout for Canadian Geese, and are ready to do battle with them at any time.